haloed with bees and beatitudes. Nine hunters of honey in Nepal, Mani Lal their head. my friend wrote more surely than Sylvia Plath. now that I’m older than Mani Lal. propitious. It was raining honey. bamboo basket lined with wild goatskin. I would take my skin from the coat my father bought. formula. Here is her snapshot in the family album. The poem was illustrated with a mermaid weeping silver tears that turned into fish and disappeared into the ocean waves around her. I liked this poem, and I thought that it needn’t necessarily be a poem exclusively or even necessarily for children. Who, afterall, is speaking in this poem? What is the emotion of it? It seems, really, to be a poem about a difficult relationship between a girl and a boy … or a man and a woman. The imagery is gendered … the connotations of some words (“tears,” “spikes,” “blue”) suggest sadness and difficulty … and the mermaid seems to be weeping by the water while the tiger is on the land looking at the stars: the two are separated by their environments and orientations. The mermaid looks deeper into the sea while the tiger looks higher into the sky. The juxtaposition of “mermaid” with “tiger” and “mine” with “yours” in the parallel lines suggests a relationship between “mermaid” and “mine,” as if the speaker sees herself as a mermaid. Likewise the juxtaposition suggests a relationship between “tiger” and “yours,” as if the speaker identifies her friend with the tiger. The implications of this are complex when the we consider the mermaid-speaker has “bikes” reflected in her eyes. The bicycle imagery conveys a most complex problem. A mermaid cannot ride a bike, and yet, like Ariel in the “Little Mermaid” (a Disney film developed from the famous fairy-tale preserved by Hans Christian Andersen), she seems to want to learn how. To do so, she would have to transform or be transformed, thereby losing something (her natural ability to navigate underwater) and gaining something (a new ability to walk on land and, more importantly, ride the bicycle that has captured her attention). The bicycle imagery also suggests a desire for movement and freedom, perhaps escape from her circumstances or maybe a means to keep up with her tiger, who is stronger and faster and more able to navigate earthly terrain. There are signs of hope in the untold story behind this lyric. “Silver fish” are pictures of life and provision and maybe even poetry itself. “Guitars” are musical instruments that can accompany songs, songs that, like poetry, emerge from the deep well of creativity within every human soul. Why are guitars reflected in the “your” eyes? Perhaps “you,” the tiger the mermaid loves, are a musician who wants to play the guitar … for many reasons … maybe even for “me,” the mermaid. How beautiful! Mermaids are legendary for their voices, for singing and for saving sailors lost at sea. Here, the desire to play the guitar, to become a guitarist, suggests these two creatures who are so different might be connected by the power of music. Of course, there is another interpretive possibility: if the mermaid is looking at the tiger and the tiger is looking at the mermaid at the moment in which this poem occurs, then it is the mermaid playing the “blue guitar” and the tiger riding the “bikes.” That is why the guitar is reflected in the tiger’s eyes and the bikes in the mermaid’s eyes. So she is sad in that case, and he is about to ride away. These contrasting interpretations remind me of the poet Robert Frost’s last lines in his most famous poem: “Two paths diverged in a dark wood, and I took the one less traveled by, and that has made all the difference.” Are these lines an optimistic conclusion? Many read them that way, but they could also have the opposite meaning, a profoundly negative meaning. Both possibilities are contained within the same words. The same is true for our poem, “Burning Bright.” This short lyric could be about a difficult relationship that will resolve in a beautiful way that brings music and poetry and life to the mermaid and the tiger … or not. The interpretive path chosen by the reader will make all the difference. MADE IN THE IMAGE is now available!!! 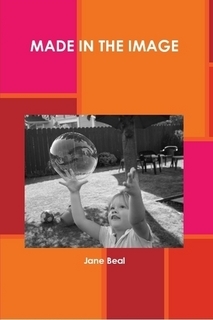 “Jane Beal takes you on exquisite journeys to the mountains of love just as poignantly as trips taken to the underground of human behavior. She is a modern day psalmist. You are invited to preview the book at MADE IN THE IMAGE at Lulu Press! and freed as a kind of offering. the valley below with thunder. never having seen a drop of rain. in a remote and hushed forest. Commentary: I’m writing a new collection of poems, sonnets actually, all about birds. It’s called “The Bird-watcher’s Diary.” My mother, Barbara Holthuis, is illustrating it with pencil sketches of many different kinds of birds. We are planning a website to go along with it which will encourage young readers to develop the skills of observation and to apply those skills to bird-watching in the natural world. Because of this work, I am very aware of birds and bird-watchers everywhere I go. I’ve had interesting conversations with other bird-watchers, like Lorrie yesterday and Ann a few days ago, both of whom maintain huge birdfeeders in their backyards throughout the year. Illinois is full of birdwatchers who often become bird caretakers as well. Commentary: I love this poem. The last two lines sound somewhat like a paraphrase of Pauline thought … but the whole poem makes me think about how e.e. cummings let all of his senses awaken to the natural world. All of us can be that awake.